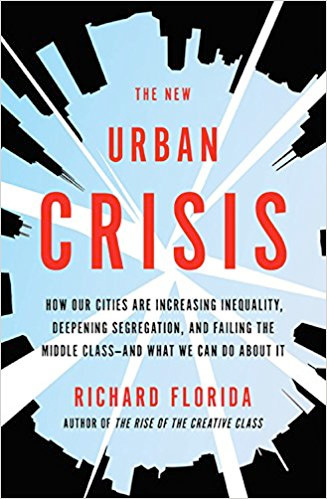 Author Richard Florida discusses his new book about rising inequality in cities. Toronto is not good to use as example. See Mother Jones’ article on influx of wealthy Chinese because of city policy of selling citizenship. Toronto is following Vancouver’s lead. Downtown Los Angeles began seeing proliferation of loft construction and suburban flight 15 years ago. Every person who writes about rising property prices conveniently ignores the fact that what is climbing is not the cost of housing but the cost of land. It costs about the same amount to build a new housing unit in Harrisburg or Philadelphia, Pennsylvania, or anywhere else. The difference in the cost of property is the cost of land. There is only one public policy that will bring down and keep down the cost of land, and that is to impose a high enough annual tax on the value of land to discourage owners of land from holding it vacant. The optimum amount of tax revenue from land is the potential annual rental value the land will yield. Land (or, more appropriately, locations) derive monetary value because of locational advantages, whether attributable to nature or the quality of public infrastructure and amenities brought to the location. Thus, “land rent” is the most appropriate source of public revenue there is. Conversely, buildings are truly private assets that should be exempt from taxation altogether. As one economist (Mason Gaffney) observed years ago, the property tax on buildings is equivalent to imposing an annual sales tax on personal property.